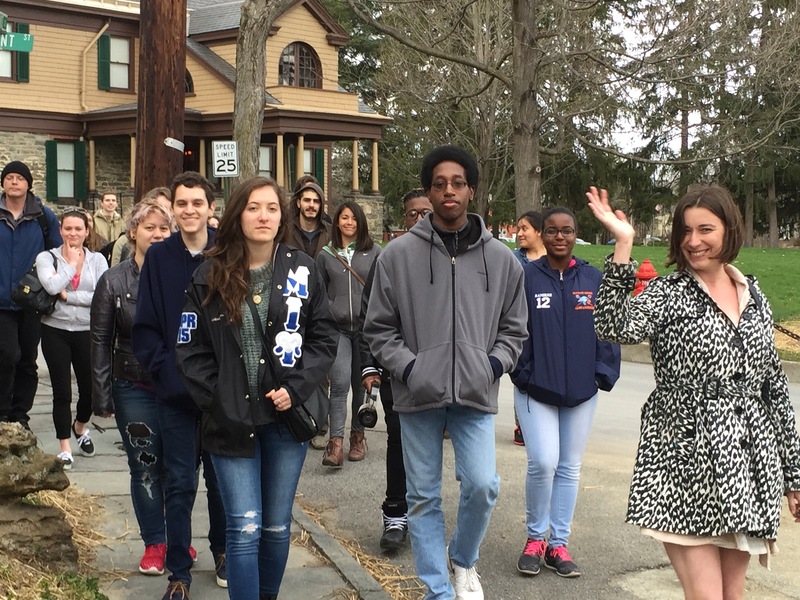 Twenty-eight SUNY New Paltz students with a passion for creative writing participated in a tour of Historic Huguenot Street (HHS), the National Historic Landmark District less than one mile from campus. The tour was organized by Creative Writing Program Director Jan Schmidt and Professor Sarah Wyman, in hopes of helping their writing students feel connected to the local history and architecture preserved at HHS. Students had the opportunity to spend time surrounded by stone houses and accompanying structures dating as far back as the late 17th century, when Huguenots from France and southern Belgium fleeing religious persecution first arrived at the banks of the Wallkill River, in what is now New Paltz. The tour was followed by a writing workshop and “Read-A-Loud” at which students, faculty and staff shared their poetry and prose in the 1799 Lefevre House. A number of students expressed feeling moved and inspired by the immersive foray into village history. HHS is a frequent collaborator with the College for tours, arts events and a summer Archaeological Field School. For more information about Historic Huguenot Street, please visit them online.